Huston-Tuttle has services for all your home and office needs, whether you need to copy an important document or family photos or make a rubber stamp to save yourself valuable time. We can order your latest business card and name plates or badges as well. 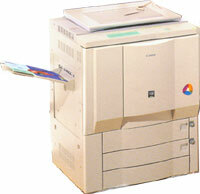 Our new machine is a Kyocera and will do both black and white copies as well as color of unsurpassed quality. The enhanced image manipulation capabilities give photo quality copies of your old family photos or company brochures and fine art quality prints of your artwork.